This month’s newsletter from the Kenyan Embassy in Berlin. Kenya’s fourth President, H.E. 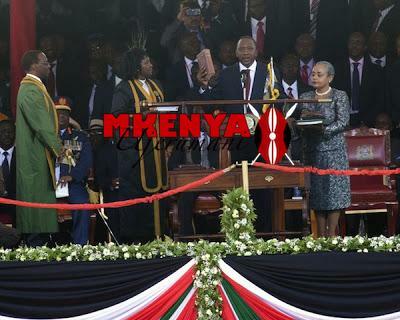 Uhuru Kenyatta, was sworn into office on Tuesday, 9th April, 2013, by the Chief Registrar, Mrs. Gladys Shollei (Left) and witnessed by his wife Margaret (Right) and the Chief Justice, Dr. Willy Mutunga (Far Left). The Deputy President, Hon. William Ruto, was also sworn into office at the Ceremony. 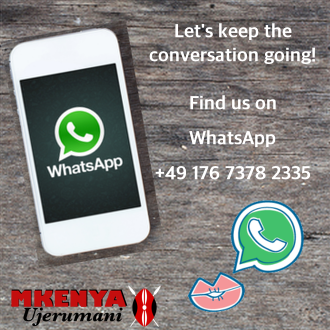 Kenyans went to the polls on 4th March, 2013, and had a peaceful election that has been lauded by the world. Following the ruling by the Supreme Court on 30th March, 2013, validating the election, the inauguration Ceremony was conducted in accordance with the new Constitution. Among the leaders present for the inauguration were H.E. President Jacob Zuma of South Africa, H.E. President Goodluck Jonathan of Nigeria, H.E. President Yoweri Museveni of Uganda and Tanzania’s President, H.E. Jakaya Kikwete. The 2013 African Ambassadors’ Business Dialogue was held at the Chamber of Industry and Commerce (DIHK) Conference Hall on 14th February 2013. 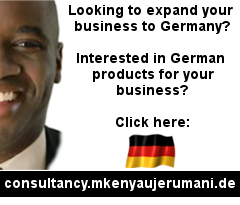 The one day conference aimed at bringing together investors from all over Germany to meet representatives from African countries to discuss investment and business opportunities available in their respective countries. A Kenyan delegation led by Prof. Micheni Ntiba, Permanent Secretary in the Ministry of Fisheries Development, Kenya, visited Bremerhaven on 18th February 2013 as part of a five day familiarization and study tour to Germany, organized by GIZ as a follow-up to the Trilateral Cooperation Project on Lake Victoria signed by Israel, Germany and Kenya. Other members of delegation were: Mrs. Susan Imende (Deputy Director, Fisheries Development), and Mr. Enos Were (Managing Director of Jewlet Enterprises) in Kendu Bay, Kenya. 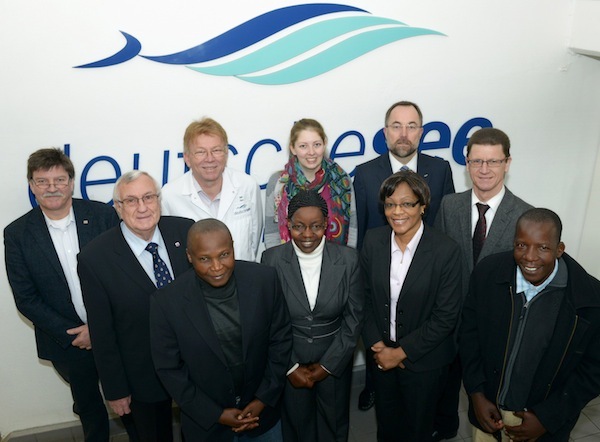 Dr. Uwe Scholz from GIZ was the coordinator while Minister Counsellor Mrs. Rosemary Owino represented the Embassy for the days’ programme, which included a visit to Deutchesee fish factory, Bremerhaven Port and Aquaculture Conference Forum. African Ambassadors and Representatives attended the 5th Round Table Water Forum on 18th March, 2013, in Berlin, to discuss water as a key resource for development in Africa. 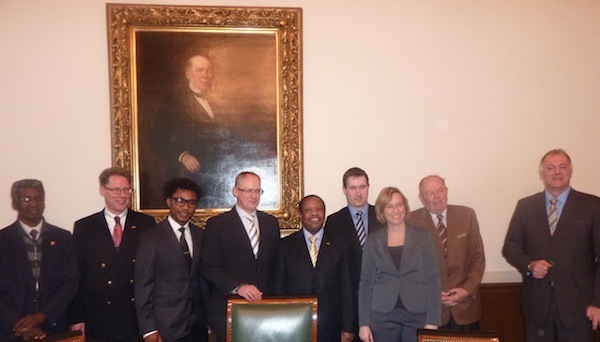 The forum was organized by Germany’s Parliamentary Group. Mrs. Rosemary Owino, Minister Counsellor, attended the meeting on behalf of the Kenyan Embassy. H.E.Ken Osinde, Ambassador of Kenya in Germany, at the Uganda Stand during EAC Day at 2013 ITB in Berlin Messe on 8th March, 2013. 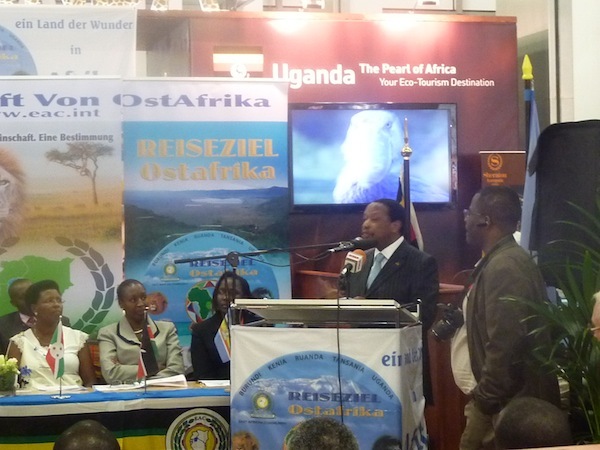 Being the acting Chair of EAC Group of Ambassadors, he gave a welcoming speech at the function. Among the key guest were: Hon. Maria Mutagamba – Minister for Tourism, Wildlife and Heritage, Mrs Victoire Ndikumana – Ministre du Commerce, de l’Industrie, des Postes et du Tourisme of Burundi, Hon. Maria Mutagamba – Minister for Tourism Wildlife and Antiquities of Rwanda, Amb. Patrick Mugoya – Permanent Secretary for Tourism Wildlife and Antiquities of Rwanda, Amb. Ruth Solitei – Permanent Secretary for Tourism Kenya, Hon. Amb. Khamis Kagasheki – Ministry of Natural Resources and Tourism of Tanzania and Ambassadors from EAC Member States. 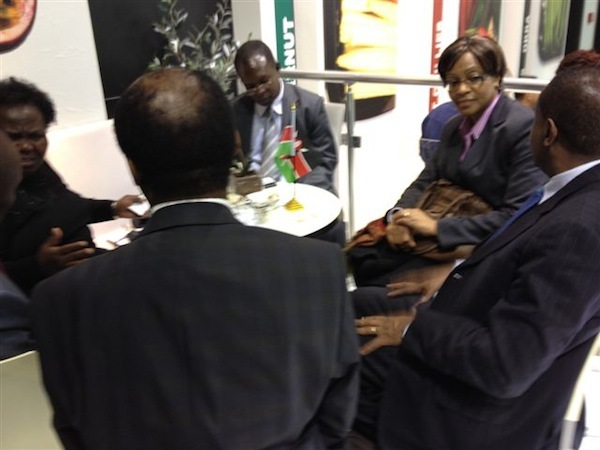 Kenyan Government Officials at Kenya Exhibition Stand at Fruit Logistica Fair held at Messe Berlin in Germany from 6Th – 8Th February 2013: Secretary of Agriculture Dr. Wilson A. Songa, Managing Director of Horticultural Crops Development Authority Dr. Alfred Serem, Managing Director of Kenya Plant Health Inspectorate Service Dr. James M. Onsando, Managing Director of Pest Control Products Board Mrs. Gladys N. Maina, Director at KARI Dr. Lusike Wasilwa , CEO of Fresh Produce Exporters Association of Kenya Dr. Stephen Mwikya Mbithi, Mr. Kefa Ombacho of Ministry of Public Health and the Minister Counsellor Mrs. Rosemary Owino. Discussion centred on Maximum Residue Pesticide Level set at 0.02 by European Union. Mr. Oliver Konje (Commercial Attaché), Mrs. Rebecca Mpaayei (Export Promotion Council), H.E. Amb. 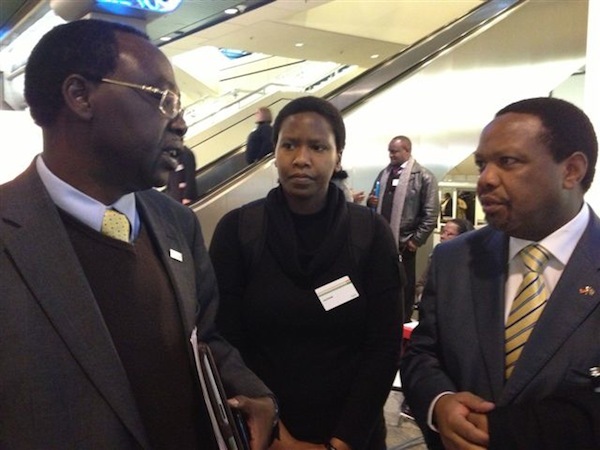 Ken Osinde and Ms. Edna Jerotich (Export Promotion Council) during the annual Ambiente Trade Fair at Frankfurt Messe in Germany, held from 15th – 19th February 2013. Various handcraft products from 12 selected Small & Medium-sized Enterprises (SMEs) in Kenya were exhibited at the stand. 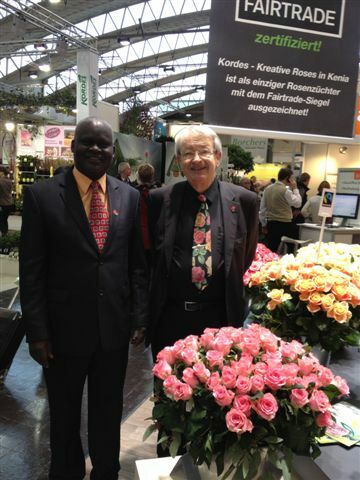 Mr. Bernd Helms-Kordes the Director of Grower and Exporters of flowers in Karen Nairobi, Kenya and Mr. Oliver Konje, the Commercial Attaché, Kenya Embassy Berlin. Kenya was represented by Horticultural Crop Development Authority (HCDA) official, Mr. Edward Maina. This event, which was held in January, 2013, brings together players in the flower industry from all over the world with the aim of creating linkages, networking and markets. Mrs. Ruth Solitei, Permanent Secretary, Ministry of Tourism, H.E. Amb. 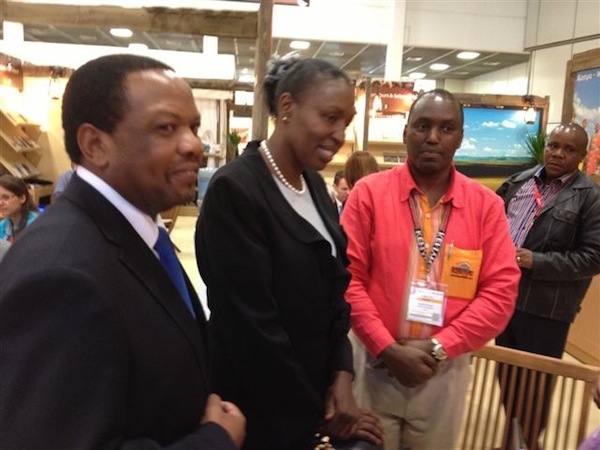 Ken Osinde and Mr. Muriithi Ndegwa, Managing Director, Kenya Tourism Board, at the Kenya stand during the ITB 2013 held in Berlin Messe from 6th – 10th March, 2013. 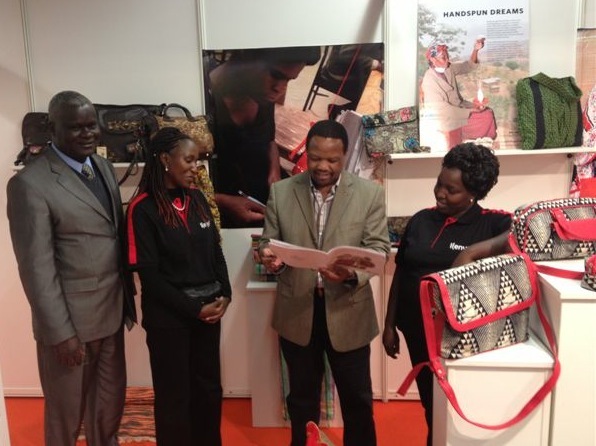 The Kenya stand won the Second Best Exhibitor Award in the African Category. 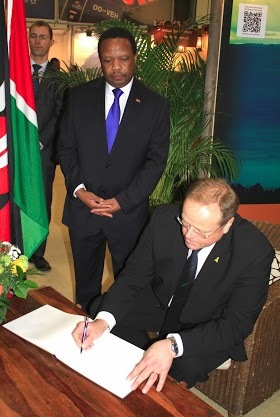 The Federal Minister for Economic Cooperation and Development, Mr. Dirk Niebel, signing the visitor’s book at the Kenya Stand during the ITB 2013, as H.E. Amb. Ken Osinde looks on. 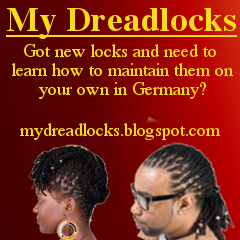 The ITB Berlin is the world’s largest tourism trade fair. The companies represented at the fair include hotels, tourist boards, tour operators, system providers, airlines and car rental companies. Mrs. Betty Ichan (KTB), Mrs. Jacinta Nzioki (KTB), H.E. Amb. Ken Osinde, Mr. Henry Wanyoike, Mr. Joseph Kibunja (Mr. Wanyoike’s running mate), the movie director Mr. Michael Hammon, Ms. Kirsten Bruhns and Mr. Kurt Fearnley, during GOLD Premiere in Hamburg on 26th February, 2013. 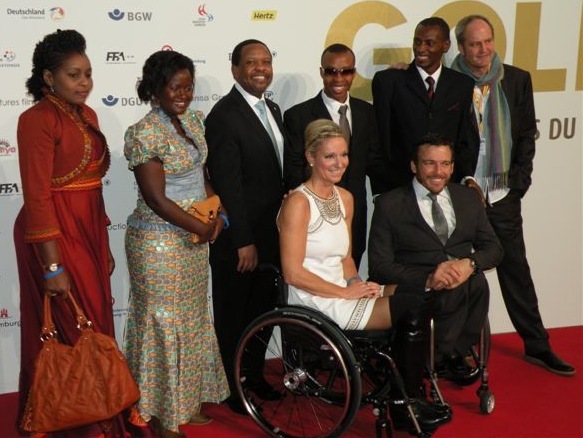 The film featured Kenyan Paralympics runner, Mr. Henry Wanyoike. Dr. Romano Kiome, the Permanent Secretary, Ministry of Agriculture and H.E. Amb. Ken Osinde with a PhD student studying in Germany, during the International Green Week Conference held from 18th to 27th January, 2013, in Berlin. The International Green Week is a unique exhibition for the food, agriculture and horticulture industries, held at the Messe Berlin. Participants at the Conference included Agricultural Ministers from all over the world. H.E. Amb. Ken Osinde presented to H.E. Traian Basescu, President of the Republic of Romania, letters accrediting him as the Ambassador Extraordinary and Plenipotentiary of Romania on 13th March 2013.The Ambassador conveyed a goodwill message to the President who lauded the strong relations and expressed his desire for enhanced economic cooperation between the two countries urging for a closer working relations with the Chamber of Commerce. The President further assured of his offices’ support for a proposed business and investment forum and trade delegations exchange. Amb. Ken Osinde further briefed the President on Kenya’s peaceful elections and the conducive environment for investment. H.E. Amb. 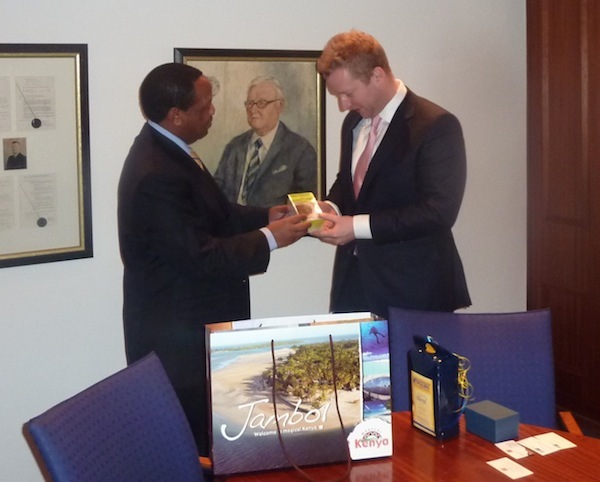 Ken Osinde presenting a gift to the Mayor of Bremen, Mr. Jens Böhrnsen, on 7th February, 2013, at the Bremen Town hall after a courtesy call on the Mayor. The Ambassador invited the Mayor to visit Kenya and proposed the twinning of Bremen City and a City in Kenya, of which the Mayor would choose. H.E. the Ambassador presenting a gift to Mr. Christian Vollers, the General Manager of Berthold Vollers Company, on 7th February, 2013. at 11.00 am at the company premises in Bremen. The Ambassador emphasized the need for value addition of Kenyan Products. Mr. Christian Vollers giving H.E. the Ambassador a tour of the Company’s warehouse as Mr. Cornell Puterczyk from the Bremerhaven Chamber of Commerce and Ms. Anja Fiebig from the Bremen Chamber of Commerce look on. The Vollers Group is one of the leading companies in transportation, storage and logistics of commodities such as coffee, tea and cocoa, as well as others goods arriving in Europe from all over the world. H.E. Amb. 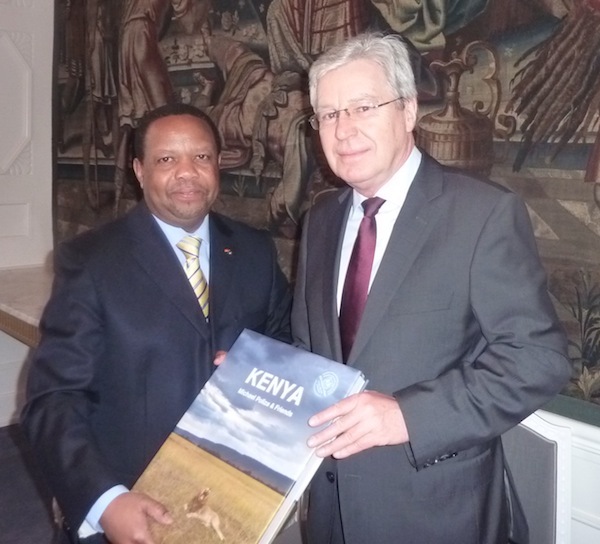 Ken Osinde making a presentation on the investment opportunities available in Kenya to the Bremen Chamber of Commerce. After the Presentation, some members expressed interest in helping to finance big projects or help provide venture capital in joint-venture partnerships. 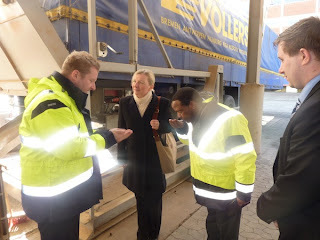 A photo session with some of the members of the Bremen Chamber of Commerce. The Bremen Chamber of Commerce represents the interests of 39,000 member companies.This includes lobbying for efficient infrastructure, promoting regional and urban development, upgrading research infrastructure as well as the expansion of traffic connections in response to changing requirements.